Wyoming's location is displayed in red on the map to the right. The State of Wyoming is bounded by Montana on the north, by Colorado on the south, and by Idaho on the west. It is bounded by South Dakota on the northeast, by Nebraska on the southeast, and by Utah on the southwest. Wyoming is the 9th largest state in the United States, covering a land area of 97,100 square miles (251,489 square kilometers). There are 23 counties in the state. This Wyoming map site features road maps, topographical maps, and relief maps of Wyoming. The detailed, scrollable road map displays Wyoming counties, cities, and towns as well as Interstate, U.S., and Wyoming state highways. The pannable, scalable Wyoming street map can be zoomed in to show local streets and detailed imagery. to view a scalable Wyoming road map. The detailed Wyoming map and the regional Wyoming map display cities, roads, rivers, and lakes as well as terrain features. The detailed map shows only the State of Wyoming, while the regional map shows Wyoming and the surrounding region. Wyoming's capital city is Cheyenne. Another principal city in Wyoming is Casper. In 2005, the population of Wyoming was estimated at 508,798, which is about 5.2 people per square mile. In 2010, Wyoming's population rose to 563,626 people. The state's Interstate Highways include I-25, I-80, and I-90. Wyoming is derived from a Delaware Indian word, meaning "alternating mountains and valleys". Eastern Wyoming's terrain features high plains and rolling grasslands which are well-suited to ranching and cattle raising operations. In central and western Wyoming, the high plateau is broken by several mountain ranges. The Big Horn and Laramie Mountains run through northern and southern central Wyoming, respectively, while the Absaroka and Wind River Mountains are located in northwestern Wyoming. The state's most popular destination, Yellowstone National Park, occupies the northwestern corner of Wyoming, but other noted attractions include Grand Teton National Park and Fort Laramie National Historic Site. For Wyoming travel and tourism information, visit the official Wyoming tourism site and Wyoming Atlas. This Wyoming reference map shows major cities, roads, railroads, and physical features in Wyoming. 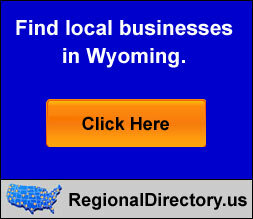 Several map publishing companies offer printed maps of Wyoming. For example, Omni Resources offers several maps of Wyoming that feature points of interest, airports, and parks, as well as selected local attractions and insets of major Wyoming cities. Wyoming-Map.org Editor, State Maps, PO Box 775, Barnegat, NJ 08005.